Ladies and gents, guys and gals, kats and kittens, I give you my THESIS !! 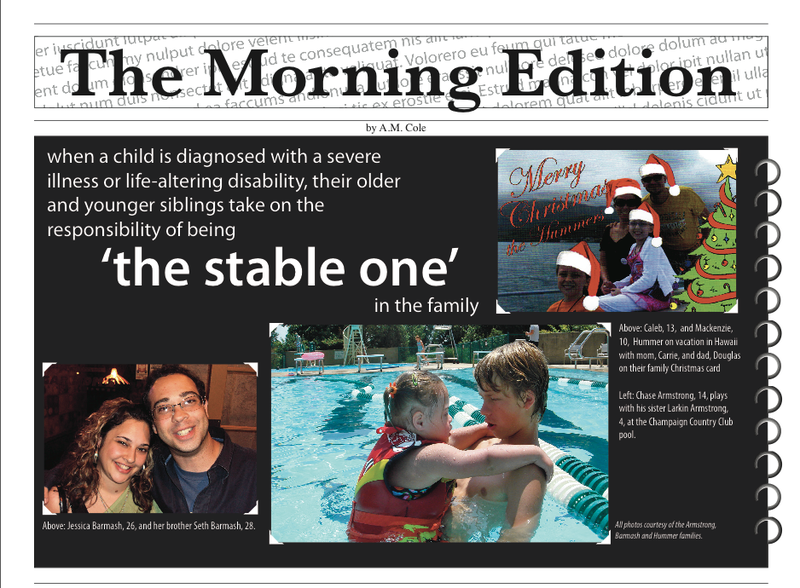 The project follows three families as they discuss their struggle to give their healthy children normalcy after their brothers or sisters have been diagnosed with a serious illness. Additionally, it discusses the role of Child Life Specialists who serve as family advocates in the hospital-patient-family-medical care professionals dynamic and healers. Finally, an autobiographical story is included. This entry was posted in Uncategorized and tagged Brain Tumor, Brothers, care, Champaign, Chicago, Child Life, Child Life Specialists, Children, Congenital Heart Disease, Doctors, Down Syndrome, Education, Families, Health, Hospitals, Intern, Medical Teams, Medicine, Nurses, Parents, Philadelphia, Siblings, Sisters, Training, Urbana. Bookmark the permalink.